English - Locations d'appartements, villa, studios à bellême ,le haut-val residences ! Situated in Bellême (Orne, Normandie), at a few steps from the golf course, the Haut Val Residences offers independent and fully equipped accomodations. 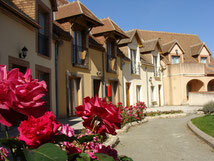 The village is composed of apartments and houses, relatively new but built as typical houses of the Perche. Surrounded by the golf course and nature, you will enjoy this calm and peaceful environement. 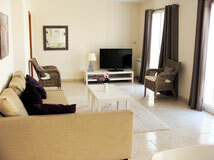 The accomodations are conceived in order to receive familial and professional guests. Bathroom and WC belong to each bedroom. 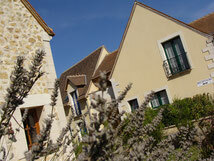 Spacious, bright and compfortable, each room is opened on the outside : nature, forest and countryside. Golf players benefit from a great discount on the green fee (until 50% of the public price). Room + golf from 49€ per day and per person. We can provide you independent accomodations, all equiped, with a free WI FI connexion.